As if you needed me to tell you, the finale of Breaking Bad was aired on Sunday night. The build-up to this television event was swathed in publicity and hype and the show has been swaddled in blanket praise for some time now. Cyberspace is awash with bloggers and reviewers telling you what they thought about the finale, and I don’t really have anything to add, except to say that if the best shows have the most unremarkable endings then Breaking Bad is in contention for greatness. It seems everyone-including the show’s creator-is at a loss to explain why Breaking Bad has been so successful, especially as later seasons attempted to alienate viewers with their unremitting darkness. Another recent television event might help us understand. Ricky Tomlinson in Controversial Last-Minute Casting Change For ‘Breaking Bad’ Finale. Last week, eponymous host of 90s’ educational children’s TV show Bill Nye The Science Guy (for British readers think a hipster nerd Johnny Ball) survived the first elimination of ABC’s ballroom competition Dancing with the Stars despite a performance roundly panned by the judges, although if they’d changed the style of dance to ‘David Byrne’ it would have been tens all around. Nye was rescued by the popular vote after his Nutty Professor-themed dance to 80s cult movie soundtrack classic ‘Weird Science’ went viral. Despite an injury-enforced exit from the show this week, Nye’s routines remain this season’s hottest properties. The common denominator in these two unlikely successes is science. Is it pure coincidence or serendipitous discovery and are American TV viewers blinded by science? Bill Nye channelling David Byrne. It seems bizarre that in a country where the mere mention of healthcare can cause the government to shut down, science is such a popular commodity. Yet again and again American TV shows flashing their scientific credentials like phosphorus in a Bunsen burner are more likely to succeed. For years, House, a medical show about diagnostic research, beat out the competition from doctoperas like Grey’s Anatomy. Regardless of genre, shows slanted towards the scientific are bound to come out on top. CSI, the most popular cop show on TV, is about forensic scientists and recently there’s been a string of TV hits based around specialists consulting on criminal investigations such as Lie to Me and Perception, the latter beginning each week with a neuroscience lecture. Perception, a class in TV! It’s true that the conversations you’ll see about Breaking Bad in the press and social media probably won’t mention the show’s scientific content, except perhaps as a joke (‘kids now want to take up chemistry’ etc.) but it can’t simply be ignored either. Chemistry, physics and biology feature most typically as a way for the characters to get out of a corner, so Walt’s knowledge of the dissolving qualities of various acids helps him dispose of a body and a home-made car battery prevents Walt and Jesse dying in the desert. 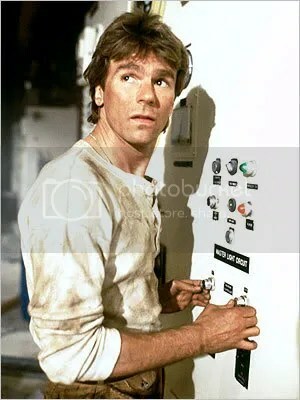 In this sense, science figures in much the same way it did in MacGyver, where the protagonist’s knowledge of physical sciences was a resource for removing jeopardy when only everyday items were at hand. But science in Breaking Bad is not simply a MacGuffin (or ‘Macgyvfin’) but the trigger for the entire programme. 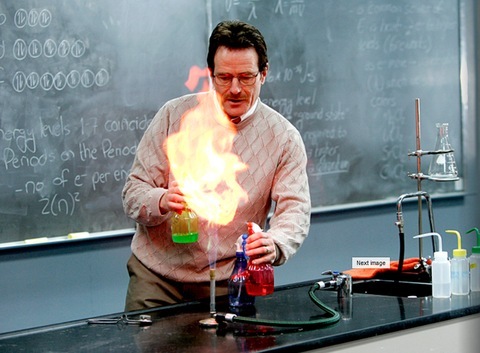 In the Pilot episode, Walt reminds us that his cooking of an unusually high-purity meth product, his route into the international drug trade, is just ‘basic chemistry’. It’s his culture’s treatment of scientists that puts him in the dilemma where meth-cooking is a viable option in the first place. While the more business-savvy of his former research colleagues soar to unlimited wealth, the true scientific genius is forced to take a severely underpaid and unfulfilling high school chemistry teaching job which can’t make up the numbers once he needs costly medical treatments. In turn, each character’s fate becomes tied to how much they know about science. Following a week in which the talk about American TV was centred on two scientists, Walter White and Bill Nye, I don’t think it’s too much of a stretch to suggest that there’s some sort of cultural fascination with science at play here. I’m not naïve enough to think that the viewing public is interested in using TV to get a scientific education but they’re certainly fond of watching scientists and having the paraphernalia of science on their screens. Maybe Americans are dying to have educated experts telling them what’s going on, something conspicuously lacking in TV news and reality, or maybe there’s something attractive and compelling about TV scientists that makes people want to follow and support them, regardless of their failures and flaws.